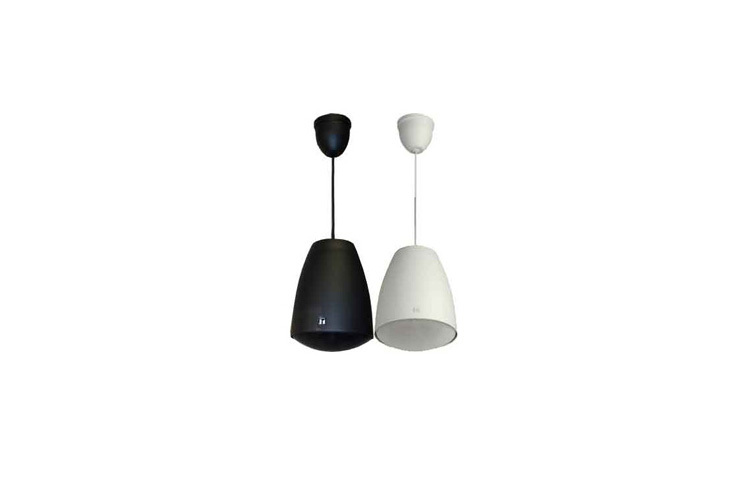 The PE-304 pendant style public address speaker is built within an HIPS resin bass-reflex enclosure using 5″ (12cm) cone-type pendant speaker and is intended for ceiling suspension installation. The PE-304 pendant style public address speakers are built within an HIPS resin bass-reflex enclosure using 5″ (12cm) cone-type pendant speakers and are intended for ceiling suspension installation. They have an outstandingly stylish design that is inspired by the finest lighting fixtures, allowing them to harmoniously blend in with lighting equipment. They are ideally suited for such applications as BGM and announcements at high-ceiling venues such as airports, factories and shopping malls. The speakers are easy to repaint, extending the range of design needs they can meet and also include a balanced dome tweeter. A directly attached sturdy suspension cable is extendable up to 16.4ft. (5 meters). PE-304 is driven on a high- and low-impedance(8Ω) line. Input impedance is adjustable with rotary switch on the upper side of the speaker. The PE-304 is backed with a five year warranty. PE-304 is also available in white.